Comics are a great way to engage kids in a story creation process. A comic isn't as daunting to embark upon as a long narrative, yet children are involved in creative thinking, choosing setting, plotting, creating dialogue and using characters to get a message across to their audience. The same skills a novelists uses, but scaled down. At Stripcreator, you'll find a fairly easy interface where you and your children can play with images and words to create a story in comic form. Once you arrive on the homepage, click on make a comic, and you get your choice of one, two or three panels, as digits just above the actual panels. Each panel offers you drop-down menus for the left and right characters, a choice of dialogue or thought boxes where you write your text, background templates, and a narration box where you can write your caption. You can't customize or re-size the characters, or add props other than what a character might be holding. But there is quite a lot of variety in each feature, and the editor works quickly and easily. You need to be registered to save your work, but you can of course take a screen grab if you aren't. Supervision is a MUST at this site, as the forum language and some of the strips are not for children. There's an obscenity filter in the top right of the screen, but it is a toggle on/off switch. 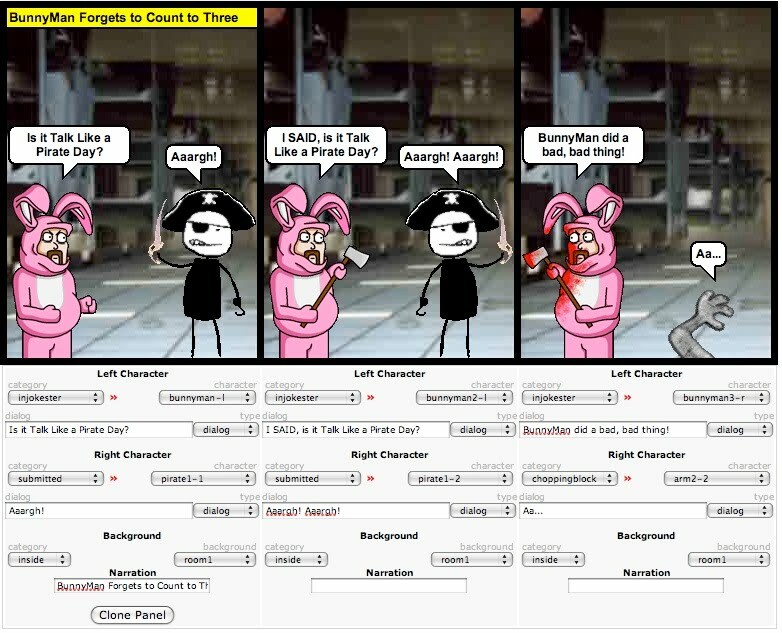 Also, some of the images are violent, as in my blood-stained, axe-wielding BunnyMan in the three-panel strip above. But I think it's still worth a look, particularly if you have teens who enjoy creating their own comics.